Above: Aerospace Engineering Assistant Professor Sean Humbert and his Ph.D. student Joe Conroy with a micro air vehicle. Below: Associate Professor Timothy Horiuchi holds a bat-inspired navigation sensor. Horiuchi has a joint appointment in Electrical and Computer Engineering and the Institute for Systems Research. 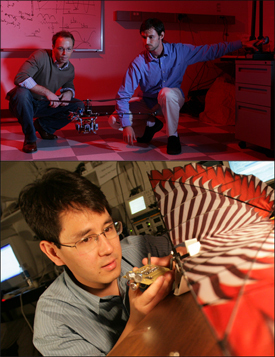 Associate Professor Timothy Horiuchi (ECE/ISR) and Assistant Professor J. Sean Humbert (AE) are collaborating with Aurora Flight Sciences, Cambridge, Mass., and the U.S. Air Force to develop a sonar and vision-based micro air vehicle (MAV) navigation guidance system. The project is titled “Panoramic Avoidance and Navigation using OPTics Integrated with Sonar” (PANOPTIS). PANOPTIS is being developed for a new generation of autonomous MAVs designed to operate in cluttered urban environments without crashing into buildings, signs, trees, wires, or other objects. The lightweight guidance system will enable “swallow-like” flight by using a combination of optical and sonar navigation sensors inspired by insects and bats. Horiuchi’s work will provide bat-based echolocating sensors while Humbert’s research results in optic flow sensors that mimic the vision of insects. Humbert, who directs the Autonomous Vehicle Laboratory, focused his research efforts on understanding biological sensory systems and sensorimotor architectures. His researchers take their cues from insects which make use of the changing patterns of luminance on their retina to navigate. “Optic flow generated during motion contains information about relative proximity and speed with respect to objects in the local environment,” says Humbert. “Insects have evolved specialized neurons, sensitive to wide-field patterns of motion, used to extract these critical visual cues.” Humbert and his students have been able to mathematically formalize the operational principles of this unique sensing capability and are developing sensors based on the way insects use optic flow to navigate. Because the wide-field optical sensor is not sensitive enough to see small objects in the vehicle's path, sonar sensors are also part of the PANOPTIS package. These sensors are being developed by Horiuchi in the Computational Sensorimotor Systems Laboratory. Based on research involving the navigation abilities of echolocating bats, these sensors are able to detect and "dodge" small obstacles such as poles, trees or wires. MAVs equipped with the technology would be used for aerial surveillance support of ground operations, special operations forces, Marine expeditionary teams, and other military units that currently use small, unmanned air vehicles (UAVs). Such vehicles are also expected to be valuable during communication outages and/or when vehicle situational awareness is lost. The target application for Panoptis is the Nighthawk, a 1.6-pound, hand-launched MAV that stores in a 6-inch tube. It is being developed by Applied Research Associates.